The world is alive with spirits. And for the witch, this fact influences nearly every aspect of our magickal practices. From the archetypal spirit of an herb, carefully harvested, dried, and burned beneath the Full Moon; to a watchful familiar, hungry and patrolling the witch’s home; to the guiding hand of an ancestor, offering advice in everyday life; to the farseeing eye of a Deity, presenting challenges and urging our spiritual growth; our work is guided and propelled by the presence of spirits. Recognizing the presence of these myriad spirits in the world and in our lives is a skill that must be reclaimed, as our culture teaches us, from birth, to ignore them. We must consciously learn to walk with a foot in both worlds, but this is not a thing that can be done without preparation. The spirit world does not suffer fools and a witch who walks unarmed is little more than such. Throughout this 3 week course, we will explore the basics of spirit work so that you can safely and effectively begin working with spirits. 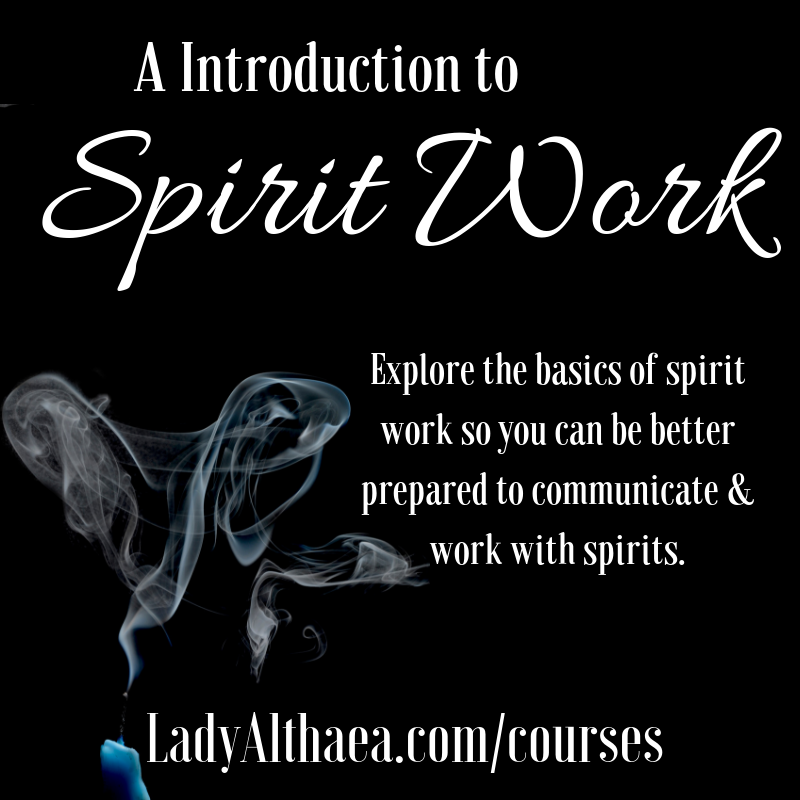 This course will not cover evocation or conjuring of spirits but, rather, is focused on helping you to become more aware of and able to connect with those spirits that already exist around you -as well as equipping you to handle any potentially problematic spirits.